The way Dr. Collins works with patients differs considerably from the conventional medical model you may be accustomed to. Please read the following information thoroughly to familiarize yourself with his process. There is also a section at the end that describes the fee structure for Dr. Collins. Each phase is described in more detail below. To determine the underlying cause of your symptom(s) by performing a thorough consultation and examination before treatment begins. To determine whether chiropractic care would help your symptom(s). It gives you the chance to ask any questions you may have about your condition and what you should expect. It provides an opportunity for us to get to know each other and determine if our clinic is a good fit for you over the long-term. A thorough review of your health history and relevant previous treatments you have had. A thorough examination which includes a posture check, range of motion, strength/muscle testing (applied kinesiology), orthopaedic and neurological tests, and a palpatory assessment. The information obtained from your health history and testing Dr. Collins does helps him identify if your symptoms(s) are caused by a structural problem (nerve, muscle, bone and joint misalignments), mental stress or inflammation (swelling) related to things like food intolerances, gut problems, or stress hormones. Or perhaps your symptom(s) are related to all three causes. By using this “test, don’t guess” approach we can zero in on the underlying cause of your symptom(s) more readily. Identifying the underlying patterns contributing to disease is the key to a successful treatment and lasting outcome. Recommendations for further testing (if necessary). This could be diagnostic imaging like x-rays, or lab tests like food intolerance testing, gut testing, stress hormone testing or blood work. In most cases Dr. Collins likes to start treatment on a patient’s first visit, but only if the patient is comfortable with his approach and recommendations. If you’re comfortable, you can begin treatment after the examination with your formal consent. Treatments typically take 5-10 minutes. Read below to find out what a typical treatment entails. Your brain controls and coordinates every part in your body including your ability to heal. Your brain also relies on good nerve signals sent into it from the joints in your body to function well. Good posture, good alignment, and good movement of the spine and extremities “recharge” or “feed” the brain with good nerve signals. Your brain can then send the proper nerve signals back to your body parts so they work properly. This creates an environment within your body to heal well. This is analogous to having all of your “electrical circuits” or “breaker switches” turned on. If you have poor posture, poor alignment, and poor mobility your brain will receive poor nerve signals. Your brain “loses it’s charge” and can’t function as well. As a result, your body parts won’t work as well and your body won’t heal as well. So your health can decline. For example, if your brain can’t send a strong enough nerve signal to your muscle, your muscle will be weak. Weak muscles will hamper your movement and coordination, and lead to unstable joints in your spine and extremities. Injuries to the muscles and joints in your spine or extremities will happen. Each treatment Dr. Collins will test the strength of your muscles and nerves as well as the alignment and mobility of your spine (and at times your extremities). He will be able to tell if your nervous system and brain aren’t working well (“blown a circuit”) when you have muscle weakness and/or immobility and misalignments. Using his hands and sometimes adjusting instruments, he will push or pull specific areas of the spine or extremities to restore mobility and alignment (ADJUSTMENT). This will “rewire you” or “turn your breaker switches back on” so your brain and nerves function better. “Turning your power back on” will turn your muscles back on making them stronger when he retests them. Sometimes he may have to work on your muscles to help break up scar adhesions within it to help make it stronger and looser. Each treatment builds upon the next treatment. Initially, more frequent treatments might be necessary to improve your alignment and mobility, and “retrain” or “rewire” your nervous system to send good nerve signals to and from the brain. Once we restore your mobility, alignment and strength, less frequent treatments will be necessary to keep your spine mobile and your nervous system running smoothly. The frequency of your follow-up appointments will depend on the severity of your condition as well as your response to the treatment. In general, if you’re really healthy, you will respond faster to treatment, and your strength, mobility, and alignment will sustain itself for longer periods of time. This means if you exercise regularly, eat well, manage your stress well, sleep well, and are at an ideal body weight, you are more likely to heal well and stay well. If you’re missing any of those pieces of the puzzle, you won’t heal as well, and you’re less likely to stay well. When Dr. Collins sees you, he not only focusses on the underlying cause of the symptom(s) you came into see him for, he focusses on improving your whole health and what your health will be like decades from that point. So don’t be surprised if he makes recommendations to improve your health in other ways. His philosophy on health is proactive versus reactive. Like our tagline says, Dr. Collins is passionate about seeing you “live pain free, with strength, energy, and clear focus” so you can live a fulfilled life and pursue your dreams. 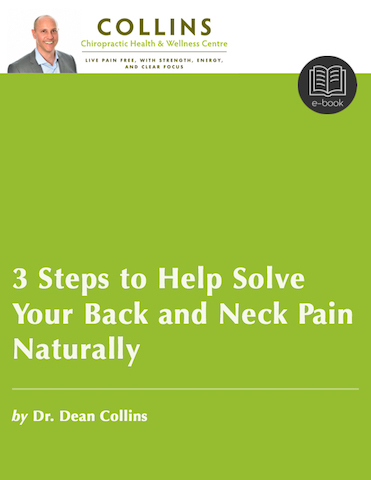 Dr. Collins is passionate about seeing you “live pain free, with strength, energy, and clear focus” so you can live a fulfilled life and pursue your dreams. Chronic illnesses have been increasing since humans started farming (agricultural revolution). (1) This includes but not limited to: diabetes, obesity, heart disease and strokes, high blood pressure, cancer, dementia, alzheimers, depression, arthritis, multiple sclerosis, parkinson’s, and hypothyroidism. So even though Canadians are living longer on average than they used to (life expectancy of 77 years of age in 1990 and 82 years of age in 2012), the last 20-30 years of life can be a challenge because most of us are burdened or will be burdened by a chronic illness (65% at present and greater than 75% by 2030) (2, 3). It is our lifestyle and behaviours, for the most part, that will determine if we get a chronic illness…not our genes. Avoid becoming a bad statistic and be proactive versus reactive in regards to your health. Your health goals are important to Dr. Collins so make sure you communicate them to him. He considers working with you as a partnership. When he knows what your goals are, he can guide you along your journey back to health better. If your goal is to be mobile, strong, and pain free and to prevent a chronic illness from arising than he will happily continue to work with you to achieve that. On top of changing your lifestyle and behaviours, regular chiropractic care is another important piece of the puzzle to optimize your health and performance and to help prevent chronic illness. Depending on your health status and circumstances he recommends spinal and nerve check-ups anywhere from 2 weeks to every 2 months. On top of changing your lifestyle and behaviours, regular chiropractic care is another important piece of the puzzle to optimize your health and performance and to help prevent chronic illness. Depending on your health status and circumstances spinal and nerve check-ups vary anywhere from 2 weeks to every 2 months. If you’re not ready to commit to get healthy or stay healthy, than treatment will end until you desire to use Dr. Collins’ services again. While chiropractic care may cost more in the initial stages, it is designed to save you money and time over the long-term by performing a through history and examination before treatment begins. Again, the “test, don’t guess.” approach Dr. Collins uses allows him to zero in on the underlying cause of your problem and come up with a more successful treatment. Many patients spend a lot of time and/or money over many years spinning their wheels, never completely solving their health issues. They also lose a lot of money because their health problems interfere with them being able to achieve a higher level of production. Here is a breakdown of the costs involved with chiropractic care so you can plan accordingly. Includes the 45 minute (20-30 minutes for children) in-person appointment. Includes the Report of Findings preparation. Billed at the conclusion of the appointment. X-rays: Covered by Alberta Health Care. Dr. Collins sends his patients out with requisition forms to Insight Diagnostic Imaging Labs in Edmonton. Prepay a minimum of $600 ($300 for Child/Student, $450 for Adult Student) up to a maximum of $1000 and receive a 10% administrative credit on your account. The prepayment option also saves you time because you don’t have to go through a payment transaction each visit. Dr. Collins will recommend a treatment schedule for at the first visit. If you schedule your appointments in advance you won’t have to go through a booking process after every visit. If your family comes in for treatments on the same day the spouses will receive 10% off of their visit. Our children fees are already set at lower rates than most clinics to encourage family and pediatric chiropractic care. We consider referrals to be a great honor, and we will welcome your family and friends as new patients always. When you refer a friend or family in as a new patient you get a FREE visit as a token of our appreciation for trusting and having confidence in us.